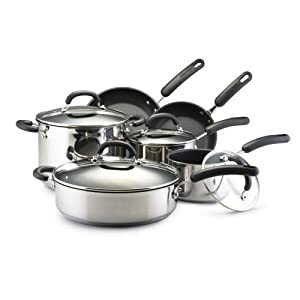 This 10 piece stainless set is priced right and includes pretty much every basic piece that one would need in her kitchen, including my favorite and most used piece I own, the deep large covered skillet. I call it a "chicken frying" pan, and it's invaluable! I don't think I need to go on and on about this set, because the customer reviews are over the moon, and the price is phenomenal. If you're in the market for stainless cookware, this could be it.